We often hear travellers wondering how and where to get a free covering letter for their visa application. You must be thinking, as if there aren’t enough things to think of and plan, here’s another addition to the long list of documents! We understand many of you must be confused as to what kind of a cover letter you need to submit to the embassy and why would you need one. In this article, we will help you understand all this and also tell you how you can easily obtain a free covering letter for your visa application in a hassle-free manner. We get this question a lot! Before we get down to discussing how to get a free covering letter, it is essential to know why you need one in the first place. Well, it is a mandatory requirement from many embassies that the applicant submits a professional letter to communicate the purpose of travel, explain what you intend to do in the host country, and in general, justify the need to apply for a visa. Moreover, this is also another way for the embassy to ensure that you are a genuine traveller who is either visiting for tourism purpose or a temporary business purpose. The covering letter acts as an assurance and validation of the claims you make on your visa application form. Think of it as a way to establish a connect with the embassy that get this one chance to form an opinion of you. And it’s important to ensure that they form a good first impression based on the documents provided by you so there are minimal chances of visa rejection. Don’t worry if this all feels a little too overwhelming. Read on to find out how we can help you get the perfect free covering letter to go with your application! This covering letter, once submitted, is then matched by the embassy with the details of the flight reservation for visa as well as the hotel reservation for visa provided by you as part of the visa application process. Do read our articles about flight reservation for visa and hotel reservation for visa application if you’d like to know more about them. A covering letter is required for both tourist as well as business visas. The purpose of visit for both of these visas is different and that needs to come through in the covering letter you are planning to submit. When drafting the letter, there are a few components that must be covered so your covering letter does not have inadequate information. The purpose of your travel to the destination country. Explain in detail what your travel plans are – personal, medical, educational or business. Proof of how you will fund your trip (own funds or sponsor). This can be typically done by attaching your bank statements if self-funded. If you have a sponsor, explain your personal relationship with your sponsor and the reason why they will be sponsoring your trip. For example, if your parents live in the destination country, you can mention that as part of the covering letter. An overview of your itinerary, which also explains why you chose to apply at the specific embassy. This section should contain your travel dates, duration and plans. If you have plans of travelling to multiple countries, do mention that as well. Your intent to return to your home country. This is one of the most important deciding factors for your visa approval or rejection. What you see below is a typical covering letter for visa application. It’s really not as complicated as it seems! 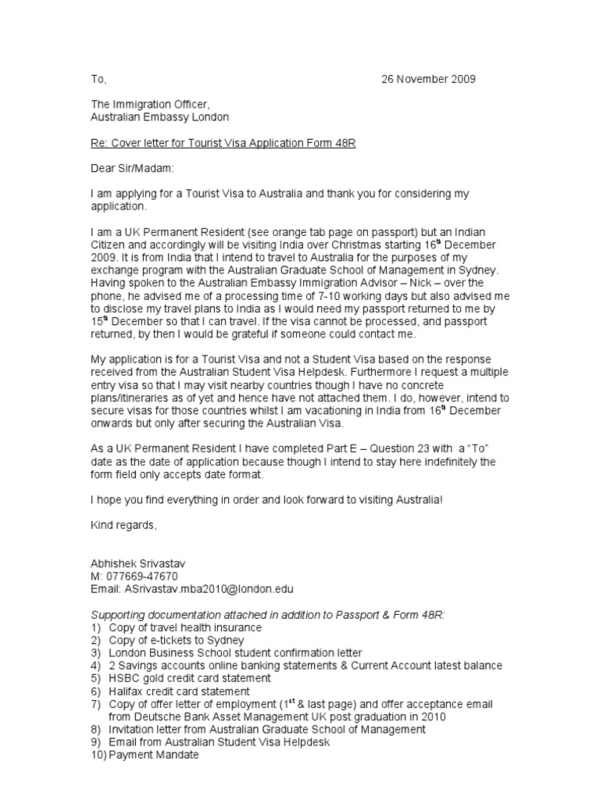 As discussed above, the sample letter contains all important details of travel plan of the applicant clearly mentioned. There is no ambiguity, which makes the applicant sound genuine and ultimately leads to higher chances of visa approval. 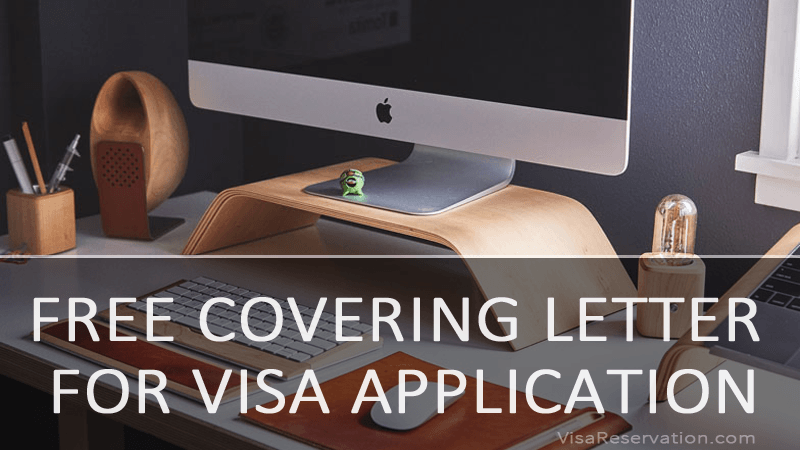 HOW TO GET A FREE COVERING LETTER FOR VISA APPLICATION? If you have been wondering and stressing about how to get a free covering letter that will help you get the visa, RELAX! That’s exactly what we are here for. At Visa Reservation Services, we have years of experience in helping our customers go through the visa application process easily and without any glitches. We are here to take all the trouble for you so you can peacefully plan your family holiday or that important business trip. We have different kinds of packages for all kinds of travellers, to help make the visa application process a breeze. The packages typically include a flight reservation for visa, a hotel reservation for visa as well as a travel insurance for visa application, along with the free covering letter. Doesn’t this make life much simpler? You just pick one package that fits your needs and we get all documents sorted for you at a nominal fee! Do get in touch with our team to find out more details of how we can help you and how you can go about choosing a package on our website.